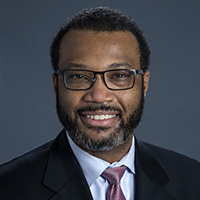 Derek Lamont West, MD, MS, is Acting Associate Professor in the Department of Radiology and Imaging Sciences at Emory University School of Medicine. A board certified interventional radiologist, Dr. West specializes in the treatment of pancreatic adenocarcinoma and other genitourinary cancers. He joined Emory Healthcare in 2017. Dr. West received his MD from Loyola-Stritch School of Medicine in Maywood, Illinois, and his Master of Science in Clinical Investigation at Northwestern University in Chicago, Illinois where he also completed his diagnostic radiology residency and vascular interventional radiology fellowship. Dr. West's research has focused on the use of electroporation in combination with chemotherapy and/or nanoparticle delivery in the treatment of pancreatic adenocarcinoma. He is also involved in radiogenomic oncologic imaging research and its effects on interventional oncology decision making. He also has a strong interest in diversity and inclusion.